This elegant jacket and vest twinset is made by Parisian designer Georgede. 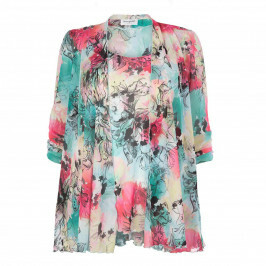 Georgede are known for their beautifully cut fluid jackets and their eyecatching prints. This twinset with a bold floral motif on a monochrome background is perfect for a special occasion. It comprises a vest and a three-quarter sleeve edge to edge jacket. Team with a black pencil skirt hat and heels for a chic and classic look.